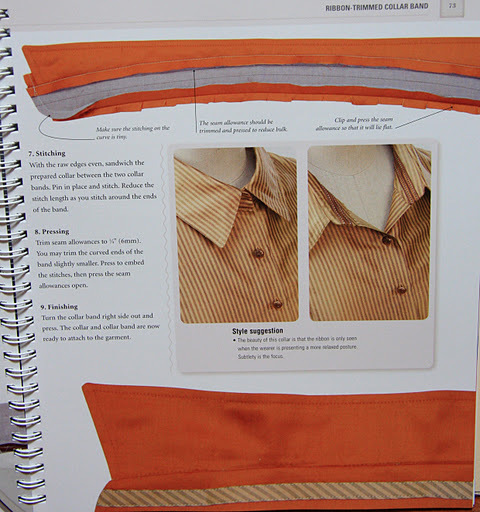 What I just adore about this book (besides the fact that the spine of is a spiral binder so it lays flat – perfect for quick reference by the sewing machine) is that it’s all about the little touches that make a garment, well… special. You won’t find anything on how to sew garments together, but you will be inspired to include a few detailed flourishes when putting together your next showpiece. 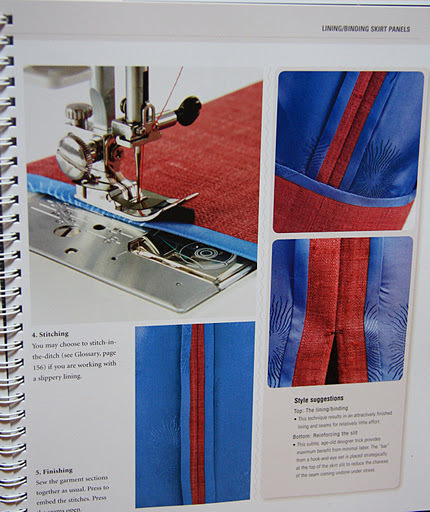 There’s some more unusual and infrequently used techniques laid out in this book that I’m dying to try – like horsehair braided hems, making your own shoulder pads, flange closures for buttons on sheer fabrics and enough different binding finishes to make your head spin. Each technique has fairly detailed photographic descriptors, and I’d say that for at least half of those included (the simpler ones!) the text and visual images for the steps are well laid out and informative. 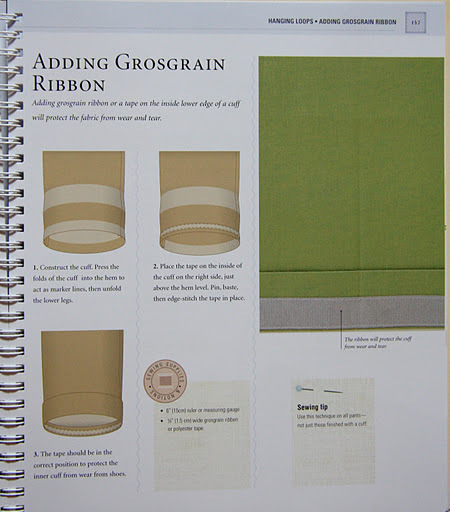 For the remaining half, I felt as though the more fiddly parts were glossed over – like there isn’t any mention of the use of interfacing your bound button holes, and no discussion is entered into over the width of the horsehair braid and how it would affect the outcome of your skirt or dress hem. 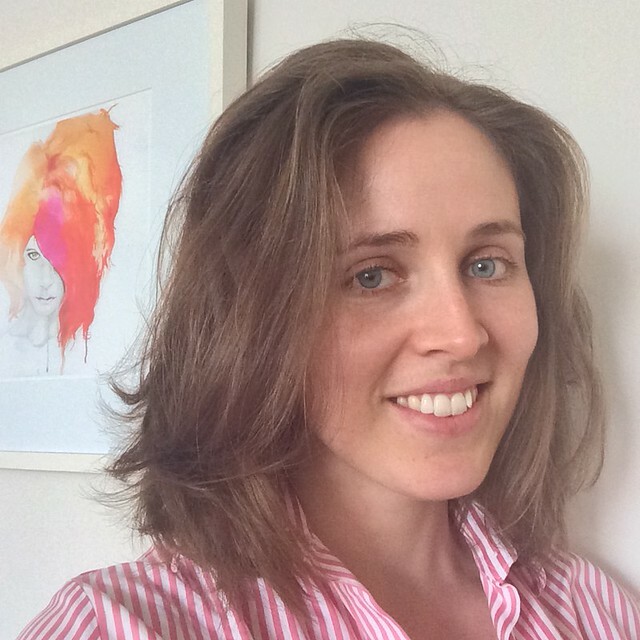 So were you to follow the instructions given implicitly, your end result either wouldn’t be very long lasting, or would look closer to home-made rather than hand-made. I’ll be referring to this book mainly as a source of inspiration and idea’s, rather than a definitive manual of ‘how to’ I think. That being said, there are a lot of techniques covered in a relatively short space of time, and like a bee to pollen I’m drawn to things that are beautifully packaged – and in that light this book doesn’t disappoint. Really enjoyed this write up, we always call bias binding Boris binding here in London!